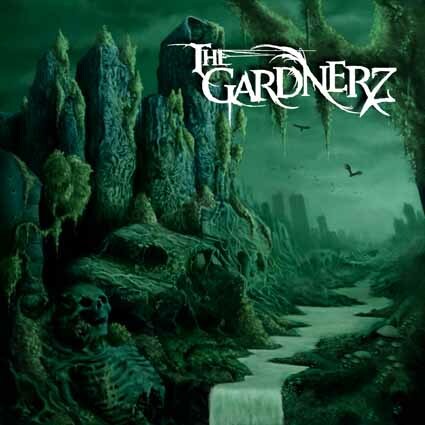 This 36 minute “EP” is my first introduction to Sweden’s The Gardnerz, a quartet that have ironed out a sound for themselves that fearlessly melds techy death thrash styled guitar work, with morose moments of spacious doom. Remember when thrash started to shift into death metal? This olden theme of awkward cross-pollination can be heard dwelling at the core of this material. The flow is well considered, even catchy at times with its crisp sound and imaginative transitions musically. The guitar tone is as tight as the playing and sounds like they are tuned to D so the music never falls into a sonic quagmire of detuned buzz (which I admittedly like a lot of the time). Emotive guitar harmonies that shed distortion on tracks like A Horrible Disease point to a wealth of musical maturity, but what dampens the impact on this material for me is the vocalist. His death growls are shallow/dry and while he often follows the guitar lines verbatim (signs of a vocalist who also plays and instrument), there is little excitement or drama built up in his performance. This is made worse when he opts for a clean pitch singing style on the distortionless segments of music. To be honest, he’s out of key, strained, and really shouldn’t be attempting this style until he gets more confidence and the bugs ironed out. This entry was posted on December 4, 2013 at 8:35 pm and is filed under ALL REVIEWS, G-reviews.You can follow any responses to this entry through the RSS 2.0 feed.You can leave a response, or trackback from your own site.